A collectible calendar. 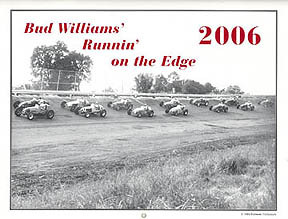 This makes the seventh year for this Bud Williams calendar series! Only the best photos were used for this historical calendar. Featured drivers Sid Bulfkin, Jerry Hoyt, Tommy Hinnershitz, Leroy Warriner, Roger McCluskey, Larry Crockett, Rex Mays, Bill Vukovich, Jimmy Daywalt, Pat O'Connor, Ted Horn, and Johnny White.